And boy, did I find that out about projects that are good for sip-and-stitch crocheting! After an amazing trip to New York City to meet my favorite yarn friends and see Lion Brand’s offices, I’ve learned how important it is to have a mindless, simple project on hand. Always. I did bring a current project, but it required following a predetermined design, and counting rows, which I found extremely difficult (read: impossible) when standing at a bar, or paying attention in a meeting, or having a conversation with anyone and still hope to speak coherently. I’m still processing all the different things I did, and things I saw, and things I ate, and conversations I had from the trip, and will share more with you later. As for the inspiration for this wrap scarf, I do a lot of perusing of knit, crochet and fashion photos to find ideas, and I found myself gravitating towards those long knit wraps that stretch from fingertip to fingertip, so I made my own crochet version. It stretches about 8 feet long and 2 feet wide. Unlike triangle wraps, it doesn’t have a center point down the back, but it is in fact, made from triangles! There’s 3 triangles in this wrap, connected together to make a trapezoid. The geometry geek in me is loving all these triangles I’ve been working with, first with the Love Triangles Blanket and then the Tangram Wrap. I just rewatched Hidden Figures today and these projects remind me of the part in the movie when a young Katherine finds geometric shapes in stained glass windows. 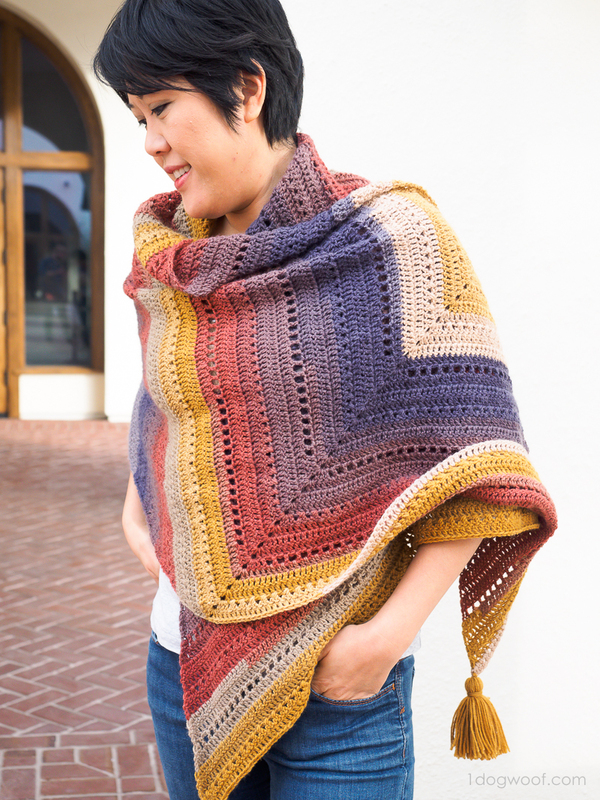 The Adirondack Wrap consists of 3 identical crochet triangles seamed together, using 3 skeins of Lion Brand Mandala Yarn, one for each triangle. If you are able to choose your 3 skeins in person (I bought mine in person at Walmart), you can pick skeins that have similar color patterns, so that the outside rings of color are the same. Pull from the center to work your triangle, and the outer rows of each triangle might be in the same color family. When you seam up those 3 triangles, the seams are nearly invisible, just showing a single color weaving a big W through the wrap. If you can’t choose your skeins, the mattress stitch used to seam the triangles together can still create a band of color between each triangle, creating its own unique pattern. The pattern for each of the triangles is super easy. Every row is a variation of double crochet stitches, with increases at the ends and in the middle chain space. Every fourth row uses either a cross double crochet or a mesh double crochet motif to add variety and texture. Also, by using Mandala, you don’t ever have to change yarns to get the gorgeous color changes, the self-striping yarn does it for you. Remember to block the triangles once they are complete. I blocked all 3 on top of each other to ensure they all had the same shape, and I did stretch them out to the full triangle shape that I wanted. I call this a Wrap, but it can easily be a super cozy super scarf too! 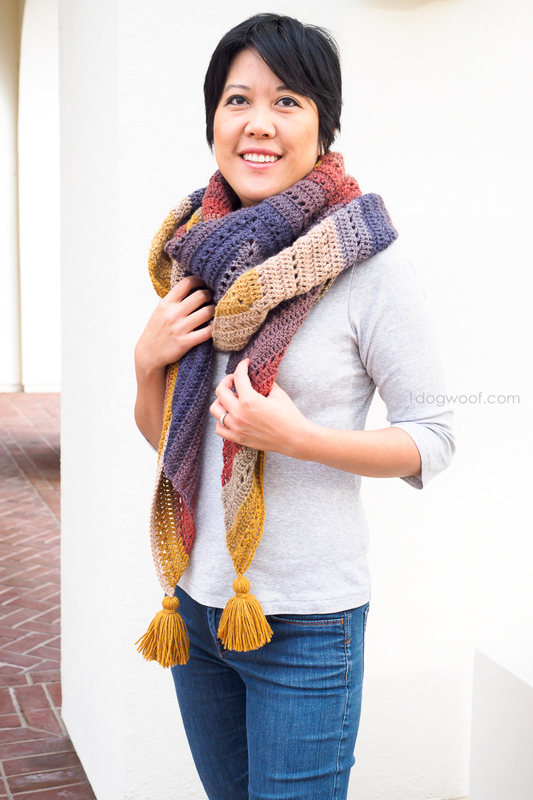 As long as you use lighter weight yarn, the wrap scarf bundles up really well, and the tassels give it a fun touch at the ends. The free pattern is below, but there are other options available for you if you’d like to work offline, or if you can’t find the yarn in your local big box store. Check out Etsy, or Ravelry to purchase an inexpensive and printable PDF for offline use. This document presents the pattern in a simple and easy to read format, without ads or comments. 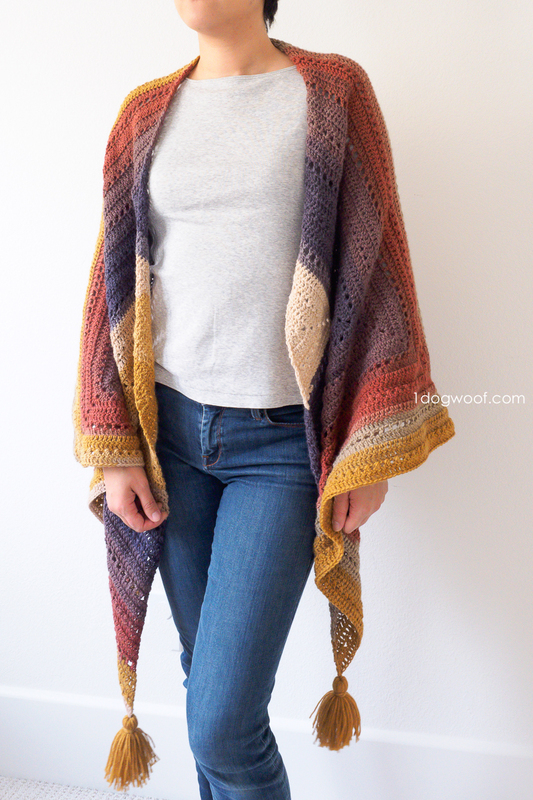 Lion Brand also has The Adirondack Wrap available as a full kit, which includes your choice of Mandala Yarn and a copy of the pattern I’ve shared below. The kit does not include the hook or other notions. Gauge is 15 sts and 8.5 rows in 4 inches. Overall size is approximately 92 inches long and 24 inches wide. row-f: Ch 3 (counts as st). Work 1 dc in same st.
row-m: Work [2 dc + 2 ch + 2 dc] in ch sp. row-e: Work 2 dc in last st.
cross-st: Skip 1 st. Work 1 dc into next st. Work 1 dc into previously skipped st.
mesh-up: Ch 1, skip next st, work 1 dc into next st.
mesh-dn: Work 1 dc into next st. Ch 1 and skip next st.
On the 3rd (last) triangle, leave a long tail for seaming. Lay out the triangles as shown in figure below. Place the 3rd triangle so that the long tail starts at the red dot. Seam the 3 triangles together in the direction of the dotted line, using the mattress stitch. Make 2 tassels and attach one to each far corner, as indicated by blue dots. I really love this particular colorway in Mandala Yarn, as it reminds me of the changing fall foliage back home in the Hudson Valley. If you make it with other color choices, let me know, I’d love to see how it turns out! This scarf wrap is so versatile, I’d also love to see how you style it! Please, I don´t understand when you say “mesh-dn”, Can you explain to me? Sorry, sorry, for my terrible english. Work 1 dc into next st. Ch 1 and skip next st. Your English is not terrible. I easily understood what you asked. Thank you Priscilla! Yes, you are correct. It must have gotten deleted by accident. The pattern should be correct now.
. This is a good pattern. Hi Inma, So sorry, yes, the mesh-dn was accidentally deleted, but I have updated the post with the fix. Thanks for your understanding! Gracias a ti por el trabajo que realizas y por tus diseños. was the Adirondack Wrap taken off your Etsy and Craftsy stores? I checked both and couldn’t find this pattern. I would love to purchase it if it still available. Hi Maria, I’m sorry you’re having trouble! It’s basically row after row of double crochets with every few rows being of a slightly different pattern. I started this and noticed that the first row is 6 stitches. when did 3 + 1 + 3 = 6? Is the chain space not being counted as a stitch? At least now I know to turn the work. Can’t wait to get started again. You have to count chain stictches thats whats not making sense! I need this explained and why its short hand? Skill level easy means simple terms not refering back and forth to a stictch guide. I agree the 3 dc chain 1 3 dc does not equal 6 sorry the short hand doesnt work either! I have been crocheting 15 yrs and does not make sense. Super disappointed i had to make my own pattern. Yet ANOTHER beautiful project! I like the Centaur colors, but I think the wrap would also look good in Serpent. It would make the wrap full of happy colors without being too bright or overwhelming. I used chimera! It’s like a subdued rainbow. This is beautiful and looks like something I as a skilled beginner could make. Thank you! Great project for me and these colors must’ve been made just for me!! Absolutely love this. Thanks for sharing. Bought the pattern thru Ravelry but paid thru PayPal. Was wondering where to go to print pattern. Looked thru Ravelry and PayPal accounts but unable to find where I can print it. 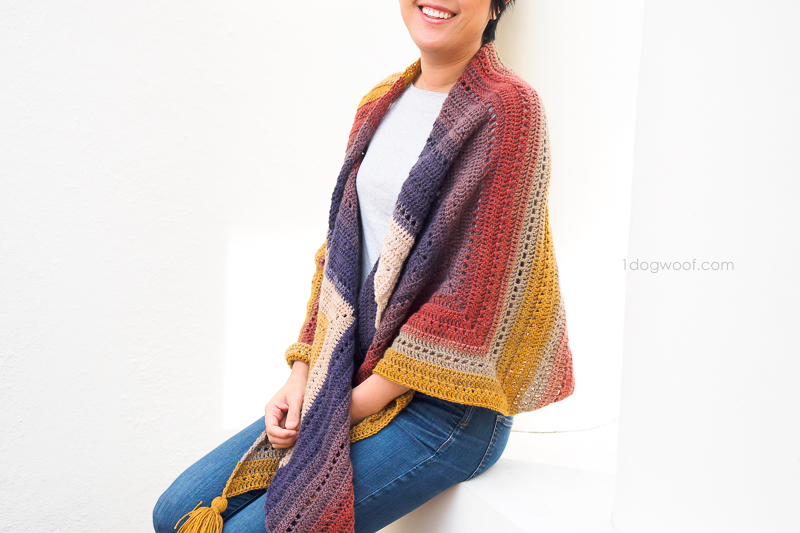 I was looking forward to crocheting this shawl but I think the short hand makes this pattern confusing because it’s back and forth from the pattern to the notes making it difficult to follow. Are the purchased patterns written with the shorthand as well? I would consider purchasing it if it’s written out like any other pattern would be. I agree. I am baffled by the shorthand- is there any other format for this pattern? 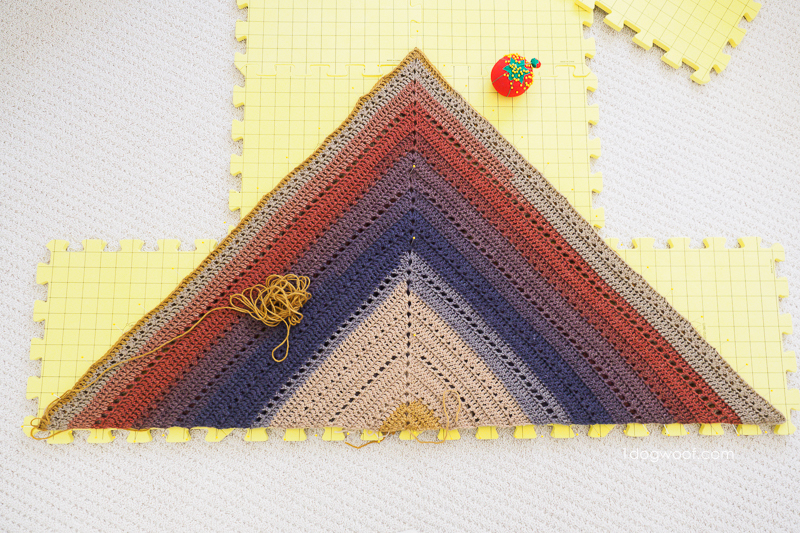 Hi Asmaa, I block the shawl using gridded blocking squares so I can see where the triangle would be. But it isn’t necessarily a right triangle, so it’s best to just block it out for flatness, using pins to make the edges straight. So gorgeous! Unfortunately we can’t get this kind of yarn in my country. And this would work aboslutely amazing for a blanket. 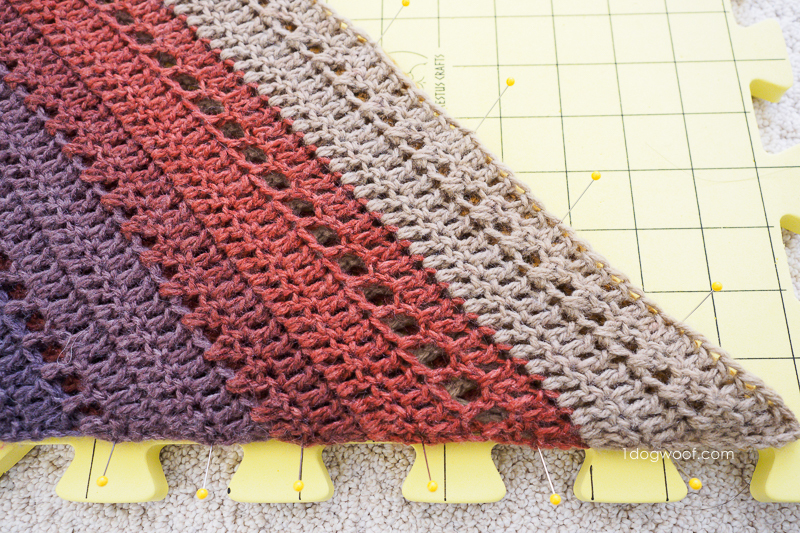 Just sew copule triangles together to a beautiful gorgeous blanket. Merci pour ce partage. J’aime beaucoup votre blog qui est très inspirant. How do you deal with the beginning magic circle? I don’t see instructions for that and I ended up with loops on my triangles. Thanks for the help!! I was super confused about the beginning magic circle as well, you are suppose to turn your work, not actually continue to work in the magic circle, once you’ve completed row one. At least that’s what I did! Hope that helps! One of the most beautiful pieces I’ve ever seen created. I am in love with the Mandala line as it is though i haven’t used this color way yet. Simply stunning!!! I wish I wasn’t such an impatient crafter. I am having trouble figuring out the first part of this pattern. A video tutorial would be amazing for how to start this. Does row-m mean to do 6 dc’s? I’m new at this and I am a little confused. What are the other pattern rows? I’m also confused by the pattern? Such a beautiful pattern! I have made it to row 34 but am having some trouble. Row 33 came out fine with 47 mesh-ups on the one side and 47 mesh-downs on the other. I only ended up with 95 dcs on my first pass back however. I have looked and looked and cannot find a missed stitch or anything of the sort to equal the 98 dcs the row was supposed to have. Any suggestions? Thanks! Love this pattern and I’m done with the second triangle. My question, why doesn’t it match my first one? I’ve counted each row, they are both the same, but one is smaller. Will blocking fix this problem? There is about a 4 row difference. Hi there! 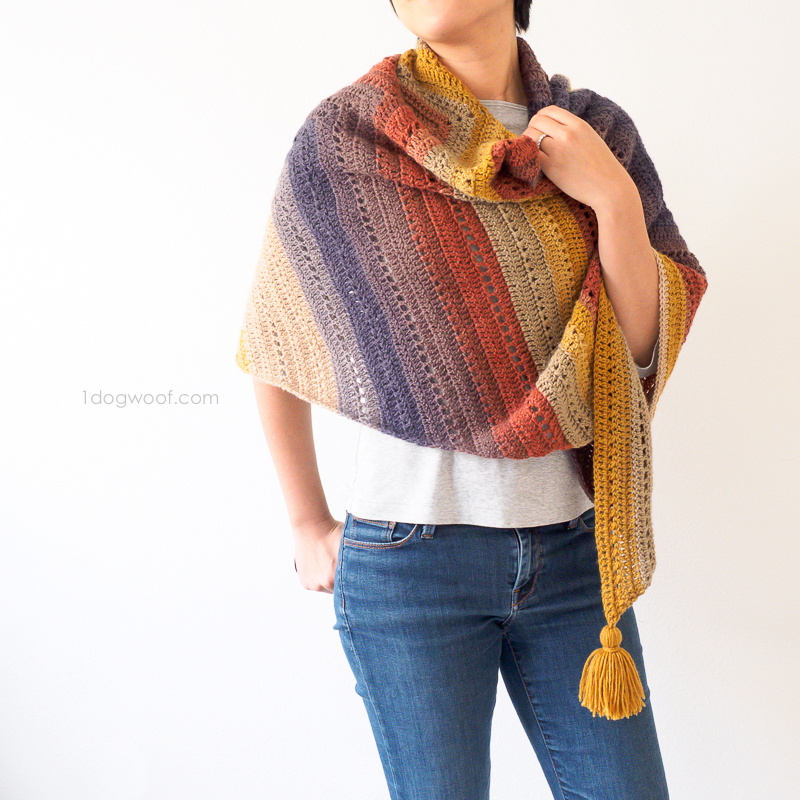 How would you recommend working up a gauge swatch? I was thinking just straight dc, but I’ve never really switched before. Thanks! What a great project to work this weekend! I guess I will make a all-white one, hehe. I’m still a newbie. This is a beautiful pattern! I’ve spent weeks searching the internet for a pattern for my mandala yarn hoard and kept coming back to this one! Everything is really clear and I love the pics, but I have a few suggestions as edits: 1) for row 1 you don’t say to ch 3 and count as first stitch, after making the magic circle, so the first dc ends up smooshed, 2) why not just write what the “rows” are in the pattern? When I printed it off I have to keep flipping the page. Just a little thing. and 3) when you say to work two dc in the last stitch in row e, specify you mean to work it in the top of the ch 3 from previous row (if I’m correct) These are newbie issues I’ve had that have tripped me up many times in other patterns. Thanks for your feedback Christy! I purchased this pattern but not clear how to start it? But don’t I need to have a chain started? I think I understand most of the pattern. The beginning is a bit confusing as I’m not used to working with a magic circle. Can I do a ch4, then 2 DC in the 4th CFH, ch 1, then 3 DC? Would this be the same thing? I think I answered my own question. Yes, they both get the job done, but the magic circle allows you to cinch the hole closed neater and more tightly. Ok I’m about to try it using the mandala yarn Sphynx. Yes, I chose to start with a magic circle because it cinches tighter. But creating a loop with chain stitches works too! For those people who, like me, thought this might be too complicated, it’s really not. Row f is the start of every row. Row m is in the middle, at the point of the triange. Row e is at the end. Each row works like this. The cross st, mesh up, and mesh down are just variations of double crochet stitches. *3 rows regular DC, 1 row cross stitch, 3 rows regular DC, 1 row mesh up/mesh down*. By the time you get through a few rows you can visualize the pattern and basically get rid of the notes. If you’re fairly familiar with shawls, it’s easy to memorize. is the paid pattern of ravelry easier to understand, ie more directions. I usually can read patterms, but this is so confusing to me. I don’t mind paying the $3.00 if the pattern has more clearer directions then what is on this blog. Hi Summer, the paid pattern is the same as what is on the blog. It is formatted for easy printing and for those who may not have constant access to the internet. Thanks! I follow the pattern but unfortunately my triangles are not looking the same, the colors don’t match each other when put together and each triangle the colors didn’t have the same length. I started each triangle from the center and I was sure all have the same colors but still no succes. Is there any Way to fix this? Any ideas? The colors may not match depending on the yarn itself. You can force them to match by doing a certain amount of rows in each color. You may also be able to get them the same size by blocking them together, on top of each other. If this doesn’t work then your tension is off, or you may have done one with a different size hook. Thats my best guess. Good luck! Thanks Trish! Yes, the yarn will vary, so you can either choose skeins that have similar gradation, or cut the yarn to match. I did block all 3 triangles on top of each other to ensure they are the same size. Hi, Thank you for your interest, but I do not allow translations to be published on other websites, as that is, in effect, copying my pattern for your own. Please email me directly if you have any further questions! I’m almost done with my first triangle, but I’m discovering that the colors Lion Brand Yarn sent in my kit are nothing like your beautiful example. I haven’t seen Centaur in a store, but the balls I was sent don’t have the nice off white, the reddest color is more of a dusty rose, and there’s no sign of the brightest blue you have. It’s pretty, but definitely not what you were able to create. . .
Hi Ayana, I’m sorry, but I don’t have plans to make a video at this time. If I do, I will definitely share it here! Hi Cynthia, once you have a tassel, I used the ends and tied it through any loop you find in the corner of the shawl. You can make a double knot and then weave in the ends. Thanks! I am in tears over not being able to read this pattern as it is written and cannot receive assistance/explanation from the person from whom I purchased the pattern. Martha, As I replied on your original request, the “row-f”, “row-e”, “row-m” and others are abbreviations, as described in the Abbreviations section of the pattern. Wherever you see a “row-f” in the pattern, replace that with “Ch 3 (counts as st). Work 1 dc in same st.” and then work the rest of the row. Since every row starts with the same instructions, I used abbreviations as a shorthand so you wouldn’t have to print an extra pages. Whether you like the shorthand or not, that’s the way the pattern is written. As another example, everywhere you see “mesh-up” or “mesh-dn”, for example, “35 mesh-up”, it means “work [Ch 1, skip next st, work 1 dc into next st] 35 times. “Every row is a variation of double crochet stitches, with increases at the ends and in the middle chain space. 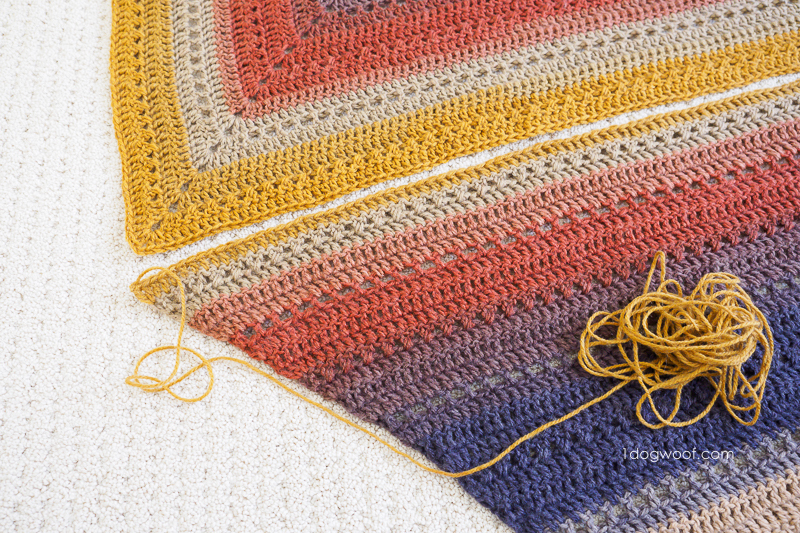 Every fourth row uses either a cross double crochet or a mesh double crochet motif to add variety and texture.” So once you get through the first 8 rows, the pattern will have been completed and can be repeated from there on out. I LOVE this wrap! Made one in Pegasus and now currently making one on Spirit. 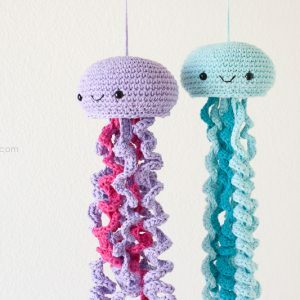 This may be common sense, but can I shorten the amount of rows to make a smaller version for my nieces? And do you have a suggestion on a good stopping point, after the three rows of dc or one of the cross then a dc row? Thank you the pattern is so easy to make! Hello, I’ve got a quick question. I know you blocked all triangles together but, what method did you use? Wet, spray or steam? Love the pattern and almost done with my third triangle! Beautiful pattern, Thank you!! Somebody help 😩😩😩 I’ve worked the first several rounds and I’m obviously messing up somewhere. It’s folding in on itself almost like a hat. It’s not flat. One comment said to turn? But I don’t see that anywhere on the pattern. Also for row-f I obviously get the chain 3 but where does the dc go? “In the same stitch” does that mean the last stitch of the previous round or the top of the ch 3 from below… I’m so confused and I LOVE this; I SO want to figure it out! Did you turn your work at the end of the row? I love this pattern! I’m starting my third triangle. Once you complete the first sequence of repeats it goes fast. I’m using the color Warlock. So excited to see the finished wrap! It was intended for a gift but I may keep this one for myself and make another for the gift! Thank you! Hi! I love this pattern! I especially love the way you wrote the Instructions! I haven’t been crocheting a full year yet and this is the easiest and best pattern I have ever followed. It saves me so much time and effort by using the “short cut” rows f, m, e and cross-stitch, mesh-up and mesh-down. You were genius to write your pattern this way. I wish more designers would use this scheme. My only issue is the hook size. I’ve just about finished the first triangle and I know I won’t have enough yarn. So I’m going to have to frog the entire triangle and start with a smaller hook. The recommendation on the mandala yarn is 5.00. I believe it will be the right size. Also, it would be helpful if you could state which crochet stitch you used to make gauge. Thanks so much for sharing this pattern. It looks like a work of art! fоr speculative or аny other type of trading to the matteｒ. Hi, I wanted to now if you can make a companion video for the Adirondack wrap or allow someone else to make one. I am a visual learner and a video would be a great help. Thanks!